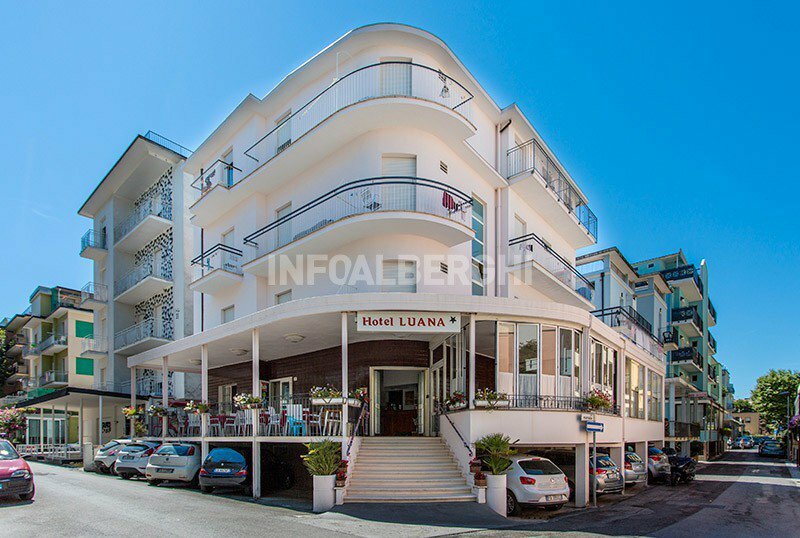 The Hotel Luana in Miramare di Rimini is a 1 star family run hotel. It offers guests free and covered parking, free WI-FI and free admission to the Beach Village water park in Riccione. The hotel is located in Miramare, between Rimini and Riccione, both conveniently reachable by bus n. 11. The beach can be reached on foot in a couple of minutes, the Rimini Miramare train station in about ten. The rooms have a balcony, WI-FI, safe, desk, satellite TV, telephone, bathroom with shower. Some rooms, recently renovated, have new bathrooms with raised toilets. On request: sea view, air conditioning, hairdryer, breakfast in the room. FAMILIES: available family and communicating solutions. Open-air porch, terrace, TV and reading room, theme nights. PARKING: covered and free subject to availability. CONVENTIONS: beach, amusement parks, discos and spas. Free and unlimited entry to the Beach Village water park in Riccione with shuttle included. BREAKFAST: buffet with homemade sweet products. LUNCH AND DINNER: two-choice menu accompanied by buffet of side dishes and appetizers. In hotel: pediatrician on request. At meals: baby food , baby menu on request, high chairs. At the beach: baby / mini / junior club, baby sitter service, afternoon snack. The hotel has an agreement with the beach n. 133, equipped with playground area, entertainment, beach tennis and beach volleyball court, WI-FI. The list prices are per person per day for a min. of 4 nights. TOURIST TAX: Excluded from the price list. € 0.50 more each night up to a maximum of 7 consecutive nights, exempt under 14 years. ALL INCLUSIVE: Full board + Water and Wine or Drink + Beach Service.